Some people more than others find it difficult to resist fattening or unhealthy foods, which makes the thought of switching to a healthy, low calorie diet a bit daunting. What you need are some simple support mechanisms to help smooth the way for you. Here we offer some tips on how to make the transition more appealing. It may sound boring but an ideal first step is to become familiar with all the good reasons for embarking on your healthy eating plan in the first place. Find out all you can about nutrition, calorie values and the foods which are going to give you the healthiest benefits. You will find lots of information on this Low Calorie Recipes site. Keeping a food ‘journal’ can scare people off. 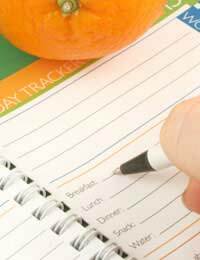 But just for a few days write down what you eat in a day, from the time you wake up until you go to bed. None of us realises just how many calories we are consuming until we actually count them. Now you know what your starting point is and where you want to get to. Now that you have worked out how you used to eat, forget about it. Apart from keeping some achievable goals in mind, you need to focus on one day at a time. To help you do this, ditch your bathroom scales (for the foreseeable future) and buy yourself a pedometer. If you are serious about losing weight, the fastest way to achieve it is to combine your eating plan with some exercise. Walking is fine - a lot of walking if you can manage it - and your pedometer will give you positive feedback, because in time you will start to see how much further you are walking and how effortless it is becoming. You will be aware of inches coming off, before pounds, so don’t discourage yourself by hopping on the scales every day. You want to lose weight that stays lost - so a slow and steady loss each week of a pound or two is the way to go. There are a few simple changes that will start to pay off very quickly. If you still take sugar in hot drinks, switch to artificial sweeteners right away. If you drink full fat milk, switch to semi-skimmed and then to skimmed (it’s easier than you think if you use half and half, and weaken the mix gradually). Whenever you feel hungry, drink a glass of water. Sometimes your body is really dehydrated and not hungry, so try the calorie-free water first. Never skip a meal. You will not be eating fewer calories, you will end up eating more, and possibly less healthily, by the end of the day. Taking responsibility for what you eat is essential if you are making a commitment to a healthier lifestyle. You will find you are taking responsibility for a lot more - your health and your quality of life. You will be surprised how good you feel about yourself as the weeks go on and you should treat yourself to some little reward when you achieve each realistic milestone you set yourself. Just make sure it’s not a food treat, of course. Some people find the support of friend invaluable and if you have a friend with the same goals as you, the whole process can be shared and fun. Online, too, there are support groups of people helping each other, but it is important to remember that you are not ‘on a diet’. You are aiming to change your eating habits for life, so that you can look forward to a healthier, fitter future, with more energy, and the knowledge that your low calorie eating leaves you in control and does not leave you feeling deprived in any way. Sometimes, especially if you are determined, you can be your own best support person. Get into the habit of leaving little notes for yourself on your computer, or the fridge or the bathroom mirror - the family will soon get used to it. The messages can help to affirm your new lifestyle, just by giving you a reminder to ‘stop and have a glass of water’ or by congratulating you for staying on track. Eat - starving yourself is not part of a low calorie lifestyle. Try one or two new foods each week, and there are so many foods you can have compared to those you can’t. Check that you are keeping your portions under control. Take your measurements - they will give you a more accurate reading than the scales in the first month or two. Make fresh, raw fruits and vegetables your favourite snacks. Learn to enjoy making delicious home cooked meals.